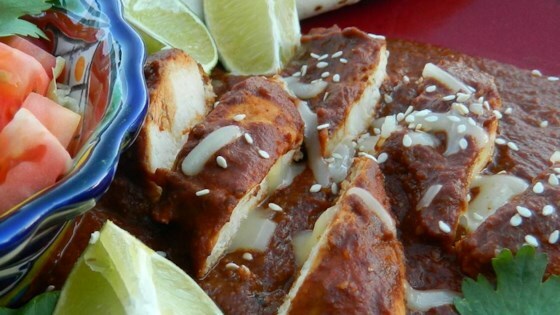 "A dark, rich, complex flavored Mole recipe. I generally shred the chicken so it will soak up the mole sauce and serve it with warmed tortillas. It is always a hit with those who like spicy foods. This recipe can be played with easily to tailor it to your own level of hotness and/or cocoa/peanut flavor. Mole is a sauce that has a lot of variations. I've even served it as a dip with corn chips!" Place onion, raisins, garlic, sesame seeds, chopped chipotle pepper, peanut butter and crushed tomatoes in slow cooker. Stir in sugar, cinnamon, chili powder, cumin, coriander, nutmeg, and cocoa powder. Place chicken in the sauce. Cover; cook on Low until chicken is very tender, about 5 hours. For those of you who dont even follow the recipe, maybe you shouldnt be rating the recipe.